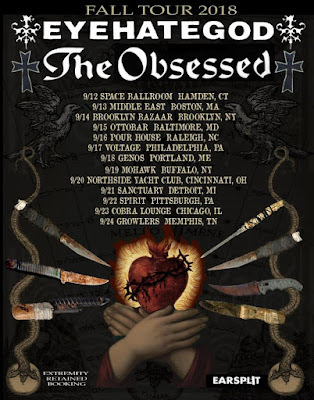 Doom rock icons THE OBSESSED will take to the streets next month on a near-two-week US tour alongside Eyehategod. The journey kicks off September 12 in Hamden, Connecticut and runs through September 24 in Memphis, Tennessee. Originally released in 1990 and out-of-print for almost two decades, THE OBSESSED's now-legendary self-titled debut was completely remastered by Relapse Records last fall. The collection boasts previously unreleased bonus tracks, including the highly-sought after four-track Concrete Cancer demo (1984), expanded artwork, never-before-seen photos, and extended liner notes from frontman Scott "Wino" Weinrich making for a true piece of doom rock history. The deluxe 2xCD version of the record includes a bonus disc containing the Concrete Cancer demo as well as a full live set from 1985 in Washington, D.C. The Concrete Cancer demo is also available separately as a limited-edition LP. Stream The Obsessed now via Bandcamp or Spotify Spotify. The Obsessed is available on 2xCD, LP, 2xLP, and digital formats. Physical bundles and digital orders are available via Relapse Records and streaming services at THIS LOCATION. THE OBSESSED was formed in the late 1970s in Potomac, Maryland by legendary guitarist Scott "Wino" Weinrich (Saint Vitus, Spirit Caravan). The band spawned in the realm of musicians/artists such as Black Sabbath, Frank Zappa, The Dictators, and The Stooges. The earliest lineup consisted of Wino, bassist Mark Laue, guitarist John Reese, and drummer Dave Flood. In 1983, Wino took over vocal duties and the band became a three-piece to record the Sodden Jackal EP. The band broke up in the late '80s after Wino moved to California to join Saint Vitus. At that time, a German label, Hellhound Records, and the booking agency that had signed Saint Vitus, released The Obsessed, originally recorded in 1985, prompting Wino to reform THE OBSESSED. After multiple lineup changes, the band signed to Columbia Records in 1994 to release their third and final album, The Church Within. Despite highly acclaimed reviews, THE OBSESSED would breakup following the release, seeing Wino forming Spirit Caravan (then Shine) and other projects. In September 2011, THE OBSESSED returned to the stage at Roadburn Festival with The Church Within's legendary lineup (featuring Wino, Greg Rogers, and Guy Pinhas). The band played a few more reunion shows over the next couple years at Hellfest Open Air 2012 and Maryland Deathfest XI in May 2013 with bassist Reid Raley. Wino announced the full-time return of THE OBSESSED in March 2016 and the band's official signing to Relapse Records to record the follow up to The Church Within. The new lineup originally consisted of Spirit Caravan bassist Dave Sherman and Wino's longtime friend and former road crew member Brian Costantino (drums). On October 31st, 2016, Wino announced another new lineup change for THE OBSESSED, including Bruce Falkinburg (bass) and Seraphim (guitar), making that the first time the band had been a four piece in over thirty-five years. In the spring of 2017, THE OBSESSED unleashed Sacred, the band's first studio album in over twenty years. With renewed energy and purpose, THE OBSESSED sounds heavier and more relevant than ever before. On Sacred, the band doubles down on enormous, heaving riffs and pummeling low-end across twelve tracks of eternal doom. Rounded out by Wino's lyrical honesty and iconic throaty vocals, Sacred is an album that further pushes THE OBSESSED into the annals of heavy metal history, well worth the two-plus decade wait. The band performs once again as three piece featuring Wino, Reid Raley and Brian Costantino.